MLF - Black White Eternity Diamond Wedding Band Adored by glamorous brides and sophisticated grooms, this Black and White Eternity Diamond Wedding Band will make a dazzling addition to any modern jewellery collection. Expertly crafted from the finest alternative precious metals, it is available as a tungsten ring, ceramic ring or cobalt ring to complement your unique sense of style. 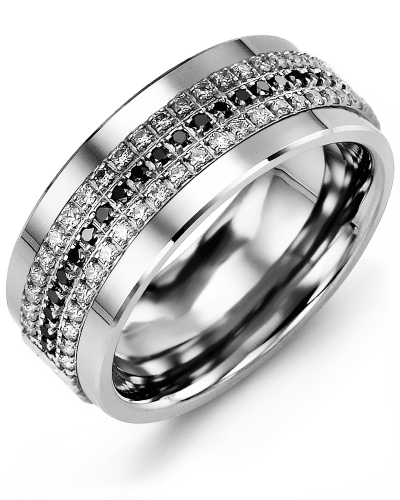 For subtle sparkle, the white gold insert is embellished with your choice of 63 or 135 black and white diamonds. Adored by glamorous brides and sophisticated grooms, this Black and White Eternity Diamond Wedding Band will make a dazzling addition to any modern jewellery collection. Expertly crafted from the finest alternative precious metals, it is available as a tungsten ring, ceramic ring or cobalt ring to complement your unique sense of style. For subtle sparkle, the white gold insert is embellished with your choice of 63 or 135 black and white diamonds. I am absolutely thrilled with my fiancé's ring! This was the best customer service I have experienced when buying on line. Craig was very quick to respond to my questions and my ring was ready earlier than I expected. The communication put me at ease since I was anxious about purchasing this without having seen it in person. The fit is just right and he loves it! Very light weight and comfortable. He couldn't stop staring at it for several days. It looks just like the picture and compliments my ring as well! Thank you so much for the care you showed me during this process.